NADS provides science and engineering support to MTS on simulator research and design. 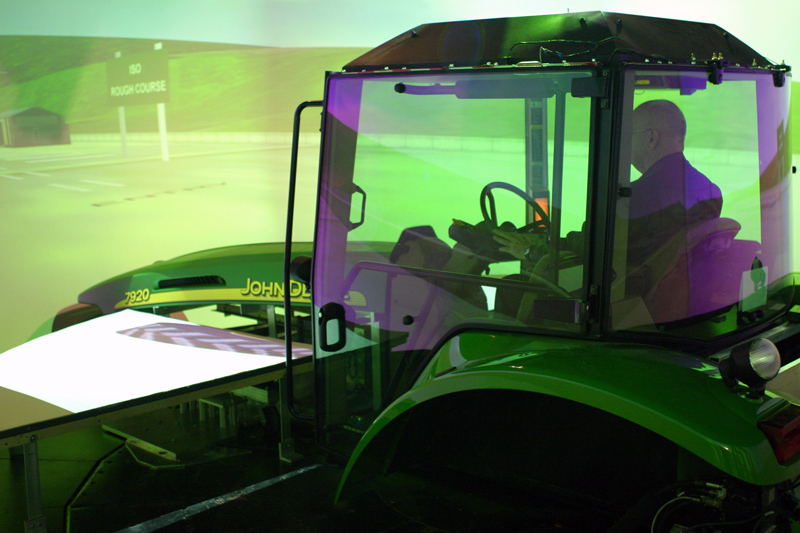 The second in a series of virtual proving ground experiments, this project funded by Deere & Co. examined driver acceptance of ride quality during tractor driving tasks. Two driving scenarios were studied and multiple methods of operator feedback were used to gauge the level of acceptance of operating conditions in each scenario. This knowledge assisted in developing future products. This project measured last-second braking and steering of drivers in the NADS-1 for comparison with test track data collected by the Collision Avoidance Metrics Partnership (CAMP). This work provided a basis for future collision-avoidance system studies at NADS. The NADS completed two studies funded by the National Highway Traffic Safety Administration (NHTSA) investigating how wireless phone use affects driver distraction and performance. The NADS, in collaboration with NHTSA's Vehicle Research and Test Center (VRTC), investigated the response of non-expert drivers to simulated tire failures and the resulting vehicle motions. This NHTSA-funded project compared the driving performance of older drivers in the NADS to that on actual roads in order to prepare for future research using the NADS. Electronic Stability Control (ESC) is an electronic, active safety system designed to help drivers maintain control of their vehicles under adverse conditions. The goals of this NHTSA-funded project are to examine the extent to which an average driver can take advantage of ESC systems and how these systems affect the driver's ability to avoid crashes. The NHTSA study complements previous work done at NADS by examining in detail the driver's interaction with and acceptance of ESC, as well as the effectiveness of ESC in assisting drivers to avoid crashes under a variety of circumstances, including wet pavement conditions. This study identifies requirements for advanced driver assistance systems that specifically address the safety needs of older drivers (defined as those over 65 years of age). Older drivers are the fastest-growing sector of the driving population. Evidence suggests that driving performance tends to diminish with age-i.e., declines in vision, hearing, reaction time, cognitive function, and motor abilities. The high percentage of intersection crashes in older drivers demands the exploration of vehicle-based technology countermeasures for crashes associated running a stop sign or red traffic light and traversing an intersection when it was not clear. The study's main objective is to determine how well older drivers can respond to a system that warns them that they are about to run a stop sign or red traffic light. A secondary goal is to develop preliminary guidelines for an in-vehicle system that would assist older drivers in negotiating intersections after coming to a stop. This NHTSA-funded project examines the effects of various lane-change collision-avoidance systems (CAS). Specifically, the goal is to determine if there are conditions under which the use of a lane-change CAS with only a proximity warning system (i.e., a blind spot detector) leads to unsafe driver behavior. The evaluation examines and compares five CAS types. The driver's acceptance of the CAS and decision to use CAS information in making lane-change decisions is also evaluated. There is a 4-fold increase in pedestrian fatalities due to vehicle collisions at night as compared to daytime. Research has shown that low visibility driving conditions are clearly a big factor in night driving collisions. When present in a vehicle, night vision enhancement systems (NVES) are supposed to help detect, recognize and avoid objects and pedestrians in a variety of low-visibility conditions. Research, however, has shown that that there are several factors that influence the effectiveness of these systems in real-world driving conditions. Opponents of NVES also point to the drawback of the driver distraction that takes place when a driver has to take their eyes off the road to look at NVES display (typically a small screen installed somewhere on the dashboard in front of the driver). Automatic warning (AW) in NVES systems have been introduced as a means to reduce the distracting task of monitoring the screen. This study aims to collect data on the effectiveness of various NVES automatic warning modes across a range of ages include novice and older drivers. This would especially provide data on the AW system's ability to reduce distraction. ESC is an active safety control system designed to help the driver maintain vehicle control under adverse conditions. ESC systems have control over the individual brake pressures at each wheel, as well as override authority over the engine throttle, all intended to correct the vehicle's path at the onset of loss of control. This study is designed to estimate the extent to which heavy trucks may benefit from ESC systems, in light of recent results for passenger vehicles in prior NADS studies. This study involves over 80 licensed professional heavy truck drivers as participants. The study is being conducted in the high-fidelity truck simulation capabilities of the NADS-1. The goal of this project funded by IDC Simulation Systems is to develop a portable, no-motion simulator of a GM Corvette. The simulator will then be used for educating teenagers on the negative effects of alcohol use while driving. The use of a high-profile vehicle such as the Corvette is intended to act as an attraction point, to be followed by various educational and informational materials. The simulator uses scenario control and visual databases that are compatible with the NADS and also partially leverages some of the subsystem interfaces existing in the NADS. However, it is built exclusively on PCs running Windows. This NSF-funded project linked the NADS at the University of Iowa and the VRAC Virtual Reality Facility at Iowa State University to investigate the effects of networking performance on the ability of the devices to perform collaborative exercises. The project focused on agricultural virtual proving ground applications provided by Deere & Co.
As part of this project, a typical agricultural exercise involving a combine harvester offloading harvested material on a tractor pulling a cart was simulated. A high-fidelity model of the combine harvester was simulated on the NADS-1, and a high-fidelity model of the grain cart was simulated at the CAVE. The ability of the tractor operator to closely track the combine was measured at various network lag settings. This comparative pilot study looks at two contact lens designs. The aim is to study how the reduction of positive spherical aberration in contact lenses translates into an improvement in the contact lens wearer's ability to read signs and recognize objects during night-time driving conditions. The study is being run in the newly improved night-time driving simulation environment of the NADS-2 driving simulator. 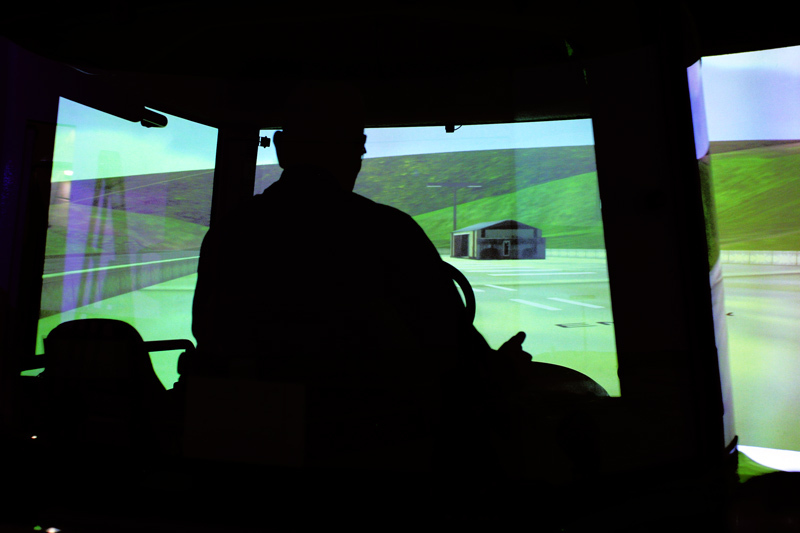 The NADS-2 simulator offers unique features, including the highest-resolution graphics currently available, combined with the ability to generate glare effects from headlights of vehicles on the driver of the simulator. This study funded by a leading pharmaceutical company compared the effects of two FDA-approved medications with placebo on driving performance and cognitive functions. Participants were tested in the NADS-1 and with neuropsychological tests while taking each of the three substances. The goal of this NHTSA-funded project is to determine the extent to which an adaptive interface system can reduce distraction-related crashes and enhance the effectiveness of collision avoidance systems by mitigating the effects of distraction and adjusting collision warnings based on driver and environmental states. NADS will be conducting a final evaluation of the system concept to determine the extent to which is effective. This project, funded by Deere & Co., developed a PC-based agricultural equipment simulator to investigate research and development questions. The software will include a user interface that allows starting/stopping the system, along with various dynamics models of the specified equipment, a simple scenario control system that allows selection among a small set of scenarios, a visual system using a single rendering computer feeding a half-dome screen, and an audio module providing audio feedback as well as a washout algorithm that will control a hexapod motion system. The agricultural company will provide a cab that will be instrumented to interface with the dynamics. The system will be compatible with the NADS in that the same virtual environment databases and dynamics models will be usable in both simulators. This study developed a geo-specific visual representation database (VRDB) of the Ethan Allen Firing Range at Fort Ethan Allen. The VRDB was provided for use on Evans & Sutherland (E&S) ESIG-3000 and E&S Harmony image generators. Additional support was provided by NADS to convert the OpenFlight representation to Compact Terrain Database format. The VRDB was populated with cultural features, vegetation, and the structures typical of these elements present within the Fort Ethan Allen Firing Range. Landmark features were constructed using photo-specific imagery for realistic representation. All roadways were modeled. The VRDB provided support for collision detection, Height Above Terrain, and infrared functionality. All polygonal surfaces within the VRDB contain appropriate identification code values consistent with their visual representation. Support and technical assistance were provided to integrate the VRDB within both the ESIG-3000 and E&S Harmony real-time environments. The U.S. Food and Drug Administration (FDA) contract aims to validate a vision test for use in simulated driving performance tests. Standard tests of vision do not measure functional performance and, in particular, driving performance. This evaluation tool would provide sponsors with a least burdensome alternative with which to evaluate a new ophthalmic device, while providing the FDA with valuable information regarding the impact of such products on public health and safety. This project studies a wheel loader using the NADS simulator. 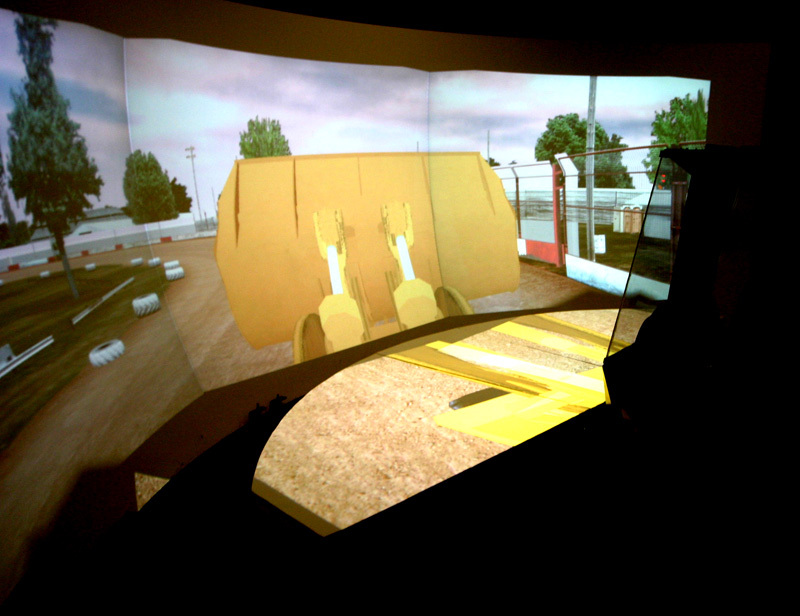 NADS staff will create real-time models both for the tires and for the wheel loader, as well as a visual database of the physical test course. A wheel loader cab will be instrumented and used in the NADS-1 simulator. This instrumented cab will allow operator inputs to be interfaced with the NADS dynamic software and will allow operators/participants to drive in the NADS environment. Simulator data will be validated with test results from an instrumented wheel loader driven by the same operators and through the same maneuvers in the real world. The NADS is working in collaboration with The Children's Hospital of Philadelphia on a study funded by the National Science Foundation (NSF) that will assess the performance and behavioral attributes of newly licensed teen drivers, and validate the NADS for use with young drivers.